Not since “Cane River,” an Oprah Book Club pick, has a book come along to strike a familiar discord of memories for Black Americans with such vivid imagery and accurate reflection. Growing Up in Mississippi is a true story. Bertha’s story. But more than that, it is the story of what it was like for many young black girls of her generation to be born into poverty and to grow up surrounded by the meanest forms of racial discrimination. To be educated in run down, second rate schools, marry early and work long hours for low pay just to keep food on the table. Read about the wayward Uncle Wigley, a cursed character among many black families who resorted to inflicting abuse on family members. A poignant work of literature and classic for the millennium. 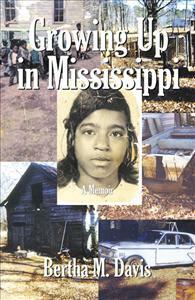 Growing Up In Mississippi is a vivid and descriptive biography that grips at the very core of every human emotion as memoirs of growing up in somewhat painfully poor social conditions in Mississippi do not deter the family, but bond them together with the unified strength and triumph most prevalent in top movies like Soul Food, or even to overcome travesties as in The Color Puple. You will be intrigued by the strong development of characters like the wayward Uncle Wigley, a cursed character among many black families who resorts to inflicting abuse on family members, and the relationship between Jay and Tish, a classic example of how women in the past wound up with larger unplanned families because love conquered all back then and even poverty. The reader feels as if they are in the story and watching without speaking. It is evidenced that life was slower paced, but more fulfilling even with the absence of television. This is a modern day tale with a happy ending and heralds the rise of our families of the past through political and social upheavals as prevalent as THE CIVIL RIGHTS MOVEMENT. An absolute must-read! Bertha Davis has done the world a great service by reminding us of how far African-Americans have come. In this memoir the reader finds himself/herself enmeshed in the horrors of racism and hatred in America, from the 1950's through the 1960's. Davis speaks of being the last one waited on hostility in a small dry goods store, in the tiny town of Webb, Mississippi. Davis recalled the details surrounded the murder of Emmet Till, in Money, Mississippi, in 1955. She also spoke of her single mother, Victoria Mae Thomas, who struggled to raise her four children, by being a sharecropper. Readers will be amazed by all of the things that went on, especially since it was so many years after slavery was abolished. But, Bertha and her family was forced to be like slaves, and at one point were shot at when they attempted to leave a plantation. Davis allows the reader to re-live her experiences of moving to Indiana, in 1965. She was shocked to discover that people weren't as friendly as the ones down home. And, of course there were some of the same prejudices in Indiana: still Davis returned to school, and after a twenty-four year absence, she obtained her GED, then went on to graduate from Indiana Vocational Technical College. Bertha Davis of Indianapolis reflects on her childhood in "Growing Up in Mississippi" (159 pages, $13.95, Infinity). She frankly discusses the racism and hardships she experienced, yet this is not a book of despair, but a book of hope. She writes, "I don't regret where I was reared, because my experience brought a great sense of appreciation to God for the things He alone could have brought me through." Bertha Davis has written a powerfully emotional story about her childhood in Mississippi. She has unlocked her heart and shared the harsh conditions that her family endured in an effort to etch out a living in the south. This book is a sincere lesson to those who have been given so many things in life and don't appreciate what God has given them. Our children complain when they don't get new shoes or clothes every week. The author has shared how a wire held their old flapping shoes together. Mrs. Davis reflected on how they took empty flour sacks washed, ironed, and wore them for clothing after her mother made them. Or how they had to bring water in from an outside pump at night and milked the cows before going to school each morning. Imagine life as a child or adult on a plantation bent over picking cotton long hours in the hot Sizzling sun producing twenty to twenty-five bales per year. Then to have the boss cheat you by saying you have no money coming or "worse" that you still owed him money. The foreman would take the money and spend it on his family buying nice cars and fine things. His family had not done any work but had reaped the benefits. Then to watch your mother crying into her pillow because there was nothing that a black person could do about the situation. On another plantation, the family worked to help a poor plantation owner get his crops out by working his fields. They had provided such a profit to the boss' family that they were able to start taking vacations and buying things. The man became so selfish that he refuse to pay her mother for their labor. He spoke badly about her to other plantation owners so that no one else would hire her. When the family tried to move, he refused to let them take their own property or even leave his land. When her mother had finally gotten fed up, they had started running leaving their house but the forman ran behind them shooting and yelling for his niggers to come back. So many more stories were shared including the potbelly stoves that were used to heat one small room in their home as well as in the school. This book will open your eyes or reaffirm things that were endured by blacks especially in the south. It is a book that everyone should read and share with their children. Mrs. Davis has so eloquently written a piece of history from an eyewitness perspective. Lena Williams, Editor of The Indianapolis Herald News Paper. Most people who have been raised outside the so-called Deep South seem to have a general idea of what life has been like for African Americans, past and present. Drawing from a combination of historical facts and cultural stereotypes many outsiders conjure up visions of plantations, catfish and growing urban communities that are now receptive to minority economic and social development. But no matter how talented Hollywood producers and fiction writers might be in their portrayals of life in the Deep South, hardly anything can be more compelling and moving than hearing the experience from one who has truly lived it. Bertha M. Davis an Indianapolis author, strives to cature the essence and lessons of the twentieth century Southern experience in her latest book, Growing Up in Mississippi. This autobiography was written originally for my family because I wanted my children and grandchildren to see how far I've come, "said Davis, in explaining why she wrote the book. A friend who admired the manuscript said it should be published for everyone to read." Davis, who's a chaplain for women inmates at Marion County Jail #1, is genial, gracious and even comforting when interacting with others. But she has also maintained a tough and durable spirit that has successfully carried her through a succession of difficult trials. Growing Up in Mississippi capture the early years of Davis, mostly in the 1940s and 50s. She was raised in poor conditions in an enviornment drenched in racism. An unfortunate but common scenario for Black children at that time. As Davis' grandmother stated in the book, "Colored folks' lives didn't mean a thing. They were killed like animals and left to die." Davis was raised by her single mother, a half-Native American who was distant emotionally but provided for her children the best way she could. Life was by no means easy, especially when one takes into account an abusive uncle and all the work Davis had to do in the cotton fields. But Davis emphasized that Growing Up in Mississippi is not a tragedy, but a story of hope against the odds. The experiences faced by her family, she said brought them much closer and inspired the college graduate to break an inherited cycle of poverty and underachievement in education. "I decided to put this out on the market because I think it will be a blessing to everyone, especially high school age youth, Davis said." "Whenever I see young people who are struggling to find themselves, I remind them that they can be anything they want to be, regardless of their present circustances." Davis has spent the past months promoting her book at libraries, schools and various events such as Indiana Black Expo's Summer Celebration, and The Hoosier Dome. She was one of 12 authors who shared their work with students during a recent celebration for arts and sciences at Key Learning Community. "I can't remember when I've had a more enjoyable time," said Davis. "One of the students personally thanked me for coming and said my life's story has taught her a lots." "We had a really great day because the students and authors were both enriched by that experience," added Mary Nolan, coordinator at Key Learning Community. Overall, Davis said she would like people to realize that they can be successful by moving forward and not using others as excuses for complications. "Often we hear people blame their past, the absence of a father or the white man for holding them back," Davis stated. "But you don't have to do that because there are so many opportunities out there today. If you're willing to work hard you can achieve anything. I was able to overcome the obstacles and you can too if you just put one foot in front of the other and try." Davis is also the author of Marriage and the Family.